The FE-CBT Other Disciplines measures skills that are considered essential for success in engineering and is the single most important factor in eventually obtaining a Professional Engineering license. Why choose a full-length FE-CBT Other Disciplines course? Testmasters guarantees the student will pass. You can repeat the next course absolutely free if you attend every class, do the required coursework, and don’t pass. Testmasters has 20 years of experience, preparation materials, and methods. Years of research and experience has helped Testmasters create the most comprehensive exam preparation guides. No one knows the FE-CBT Other Disciplines Exam better than Testmasters does. The Testmasters instructors have years of experience and are required to repeatedly take all of the same tests that students are preparing for. Testmasters puts its teachers through a rigorous selection and training process before they can set foot in a classroom. Ongoing training and development, as well as taking the same tests repeatedly, are the secrets to their success. How is the Testmasters FE-CBT Other Disciplines course set up? Review Course: Theoretical concepts are explained to refresh and give students an understanding of important exam topics, and many example problems are worked to reinforce these concepts. The focus of the review course is to review the important concepts needed for the exam and begin to develop the student’s problem-solving proficiency. Problem Solving Workshops: The workshops supplement the review courses for the examination. Since the actual FE-CBT examination is all problem solving, numerous exam-like problems will be solved to give students intensive problem solving practice to perform well on the examination. For the PE courses, the workshops focus on the depth (PM) examinations but certainly help increase the score in the breadth (AM) part of the examinations. 100% of the time is devoted to problem solving and strengthening students’ proficiency in solving exam-like problems in a timed environment, similar to what you will be doing on the exam day. For some locations, the review course and workshops are offered separately, and in other locations the review course and workshops are combined as one complete course. The Guarantee of Passing only applies when both the review course and workshops are taken together. Our course covers all the topics that appear on the FE-CBT Other Disciplines Exam over a period of 78 hours. The following topics are covered in class: mathematics, probability and statistics, ethics/professional practice, engineering economics, computer science, statistics, dynamics, strength of materials, materials science, fluid mechanics (liquids and gases), electricity/power/magnetism, chemistry, thermodynamics, safety/health, and instrumentation/data acquisition. 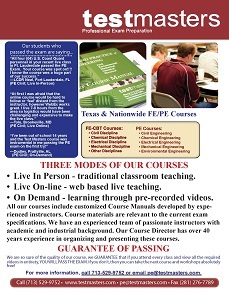 The FE-CBT Other Disciplines course has a flexible class schedule that varies depending on what course you take. Classes take place either once or twice a week, with each lesson taking from 3 to 8 hours. The course itself generally lasts for a little over a month. For specific scheduling, see the Testmasters Engineering brochure. The full length course fee varies by location and includes all materials. There are opportunities for additional discounts as well. If registration and payment is received by the early registration deadline, which is 10 days before the start of the course, there is a $100 discount. Full-time undergraduate senior students will receive a 50% discount off the regular fee when taking the FE-CBT Other Disciplines review course and workshops. No additional discounts will be given. Proof of full-time enrollment status (12+ credit hours) must be submitted with the registration form before the discount will be given. The student discount is not offered for the FE-CBT online courses or PE course. Three days before the start of the course, the fee will be fully refunded. Afterward up to one week, refund will be on a pro-rata basis less $150 administrative fee upon a written request for a refund. No refund will be given after one week of the start of the course. No refund will be given for the classes missed or not attended prior to our receipt of the written request. No other requests will be considered. The free repeat has no cash value. No refund will be given for not repeating the course. It is not transferable to any other course or person.